New Melones Lake level is currently at 1039.05. Water temperature across the lake has been 81-84 d. A smokey haze has been looming over Melones lake for many weeks now, but with the suppression of some of the largest fires in California history blue skies are starting to reappear. Glory Hole Sports would like to acknowledge the human sacrifice in fighting these fires and our thoughts are with families, crew members and friends of the fallen. The enormous amount of work our state, local and federal support in knocking these fires down deserves a big THANK YOU. September 3, labor day we will be open from 6:00 am till 3:00 pm. We are anticipating great weather for the 3 day Labor day holiday, come in and load up with fuel, tackle, lake toys, deli food, drinks and ice before hitting the lake. Trout bite on the lake has been slow the last two weeks, most all anglers without a boat to troll for them are fishing rivers. There is a link on our website that will indicate where Ca. Dept. Fish and Wildlife are planting trout. Trolling anglers are landing a combination of Trout and Kokanee. Rainbow flashers, blue/orange hoochie and Pro Cure scent on your blade. Also Apex lures in a rainbow color will draw strikes. The Kokanee can be found on the main lake holding over hill tops in deep water 80-100 ft. Orange scale dodger/flasher with orange hoochie seems to be working along with green frog colors. Nice 4-6 lb. 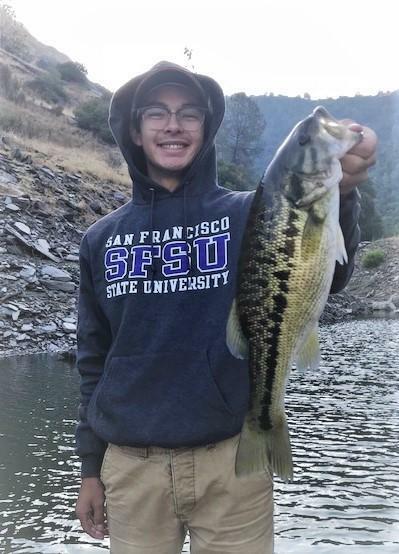 largemouth bass are being caught on Melones. Anglers fishing the lake in the evening have been doing well fishing spinnerbaits. If the bass are coming up short, you can add a trailer hook to your bait. Just trim your skirt a bit then add the trailer. Glory Hole Sports Annual Catfish Contest is on the horizon. This year we are holding the contest in the month of October (AKA large catfish month) We will be holding sign-ups starting in September. Catfish are coming out at night. Drop a line with some cutbait, hang a bell on the end of your pole and go fish. Tuttletown coves and by the dam have been good places to fish cats. Crappie are on the bite feeding in and around coves. Live minnows, top water baits and plastic crappie jigs are productive baits to use.